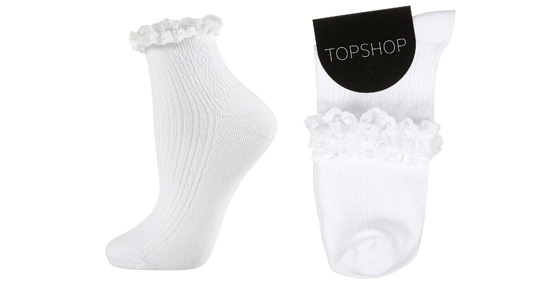 I've been wanting these frilly ankle socks from Topshop forever but always seem to forget to pick them up when I go to the shop. I've added them to my online basket so fingers crossed next time I check out I'll remember to get them! I just think they look so cute with little dolly shoes and with chunky boots to give a feminine edge to a tough looks. I love these type of posts lily, as I get to understand how your thought on potential purchases. These are really cute, I've always wanted some sparkly ones, but I think they'd be difficult to pull off! Love these! totally remind me of the socks i used to wear to school with those little summer dresses! Love these, I could never pull them off though! What would you wear them with? Too cute! I have these in mint, they're so cute but they're really short so I can't wear them with my boots :[ maybe you'll have more luck!! I love these socks. I brought 3 pairs of them last month. Oh, I need these too. I have a similar pair from AA but they were much more expensive so I never bought a second one. But these socks are so cute. i picked up a pair of these in peach whilst i was waiting in the queue at topshop and they are really cute. great to wear with little brogues or allegras like you said. im definitely going to pick up some in other colours when im next in or placing an order online. Wow, those are just the cutest pair I've ever seen. Thanks for sharing! I bought these a while ago and haven't really got round to wearing them yet. I wore them with my disco pants and converse in one of the outfit posts on my blog, but then took them off when I went out because I thought I looked silly, but they are really cute!